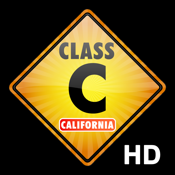 The LATEST most up-to-date Class C California driving license test app on iTunes for 2013. Our driving apps are rated 5 stars and in the Top 35 Education apps. Why should you get this app? Other apps just have test questions. Class C Test California has a lot more: accurate test questions, a lesson on traffic signs, a time challenge mode and a road sign identity game. Our test questions are extremely similar to what you will see on the official test. Our app includes unlimited tests! The tests are different and random every time.